This recipe is my take on a popular restaurant dish that can be made easily at home. Heat olive oil in small pan on low heat. Add diced onions and garlic. Stir. After a few minutes, add can of drained and rinsed beans. Stir. Add slightly drained can of diced tomatoes. Stir. Add mixed dried Italian Herbs. Stir. Remove from heat. Cool. Then, chill for 2-3 hours. Place mixed greens on plate. 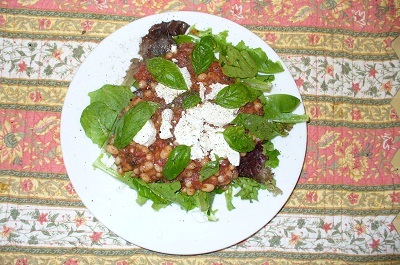 Top with bean/tomato mixture. Then, add slices of goat cheese. Top with fresh basil and fresh ground pepper. Then, drizzle olive oil on top. Important Note: The goat cheese and fresh basil make this recipe special. It's worth searching for and buying high quality Fresh Goat Cheese. Return to Simple Recipes from Tuscan Salad Recipe.